SUFFOLK HOUSE CONCEPTS LOOKING GOOD! This is lining up to be a great project….! Dream plot in a sleepy village and some really nice clients. The design concept is based on really traditional styling so lots of nice steep roofs, simple fenestration patterns and random arrangement of built form to create interest. We are just at pre-application concept stage right now so will keep you informed of progress on this one…. 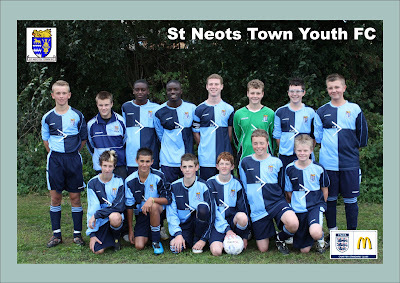 We are very proud to announce that we are sponsoring St Neots Town Youth Football Club this season……. PJT Design were approached as a potential sponsor and (bearing in mind its my nephews team) we were very happy to accept and assisted in the new shirt design and provision of kit for the team. They just missed out on the treble last year and as of today they are top of the league having just won at home against Buntingford on Sunday with a 3-2 victory so we are all looking forward to a good season again. As sponsors, we will be actively involved with the team throughout the season and we wish the boys much success! It is also worth mentioning that these lads are all an absolute credit to their parents and their club and you could not meet a better group of guys. It is so easy to get brainwashed through the media into thinking all teenagers are trouble but it is only when you get involved with lads like this that you find out it is simply not the case. If there was ever a dream plot, i think this one would rate high on the list!… wonderful countryside views, a large natural pond and a wood and stream at the bottom of the garden… very nice. We have been working with these clients for around a year now and they wish to replace their current dwelling. The plot is just into Green Belt so has its fair share of difficulties to overcome but i think we have put forwards a scheme which should get planning, but as always in such scenarios, will take longer. The design concept for the project is that of a simple traditional 3 bay barn finished in black boarding for that classic Essex barn look. We have however added some more contemporary components such as the covered balcony which we think works really well. 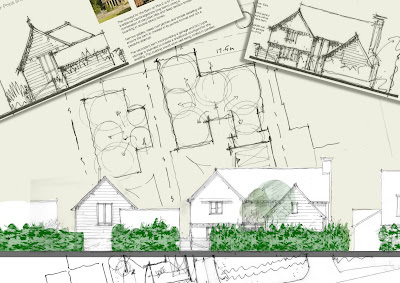 The formal planning application has now been submitted so we will keep you posted on progress. This one has been a while in the making but we got it! 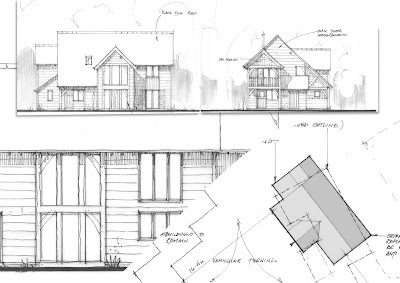 The job involves the demolition of a single house in a Conservation Area and the replacement thereof with 2 bespoke designed oak framed dwellings. 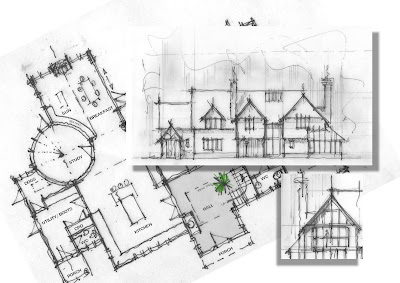 The right hand plot has been designed to represent what could have been an orginal farmhouse and the left hand plot to reflect what could have been farm barns and outbuildings, now converted. This concept proposal was the idea of the clients and we just evolved it for them through the design phases. We are very pleased to have now received formal planning approval for the scheme and really look forward to seeing the project built as we know they are going to make a really good job of it! This has been a really enjoyable house to design for some great clients….. we also have had a generally positive response to our pre-application work and the formal application has now been submitted. Will be due a decision in around 4 weeks so will keep you posted…. 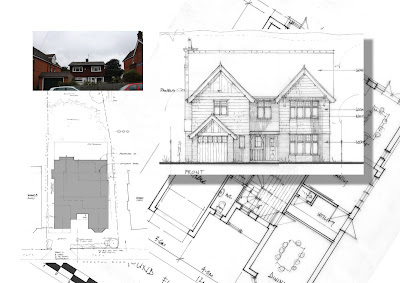 The existing house is very unique within the streetscene as it is a small bungalow chalet whereas the rest of the adjoining houses are large 2 and 3 storey dwellings so it seems to make sense to knock it down and match it in with the rest….! This of course not just for cosmetic reasons though. The existing dwelling is poorly constructed and serviced and it is with the new build that our clients will be able to produce a really good looking house but also one which features environmentally responsible and efficient technologies.